Half the class members somnolently raised their hands. We’re dealing with deep mysteries here – and Dante himself says so. That Beatrice is speaking not so poetically, but more like a scholastic theologian, is evident in the number of times Dante places the phrase, “Now pay attention people, or you’ll miss this…” (or its rough Italian equivalent) on Beatrice’s lips. Dante is doing theology, like only Dante can, and stretches not only the limits of good Terza Rima, but human logic as well. But here’s the key starting point, I think: if we have a hard time understanding the theology of the cross (or the mystery of the Trinity, for that matter), it’s because we’re weighed down in human concepts, human ways of thinking, human ideas of justice and mercy that have the potential to make us miss the mystery of love, whose nature can seem to our human minds strange and paradoxical. The only way we can really fully understand it is through the lens of love itself, or (more precisely) in the light of love, whose glow seems to be increasing the closer heavenward we venture. So, we encounter the first paradox: how come God both required a sacrifice to balance the scales of justice (i.e. the sacrifice of the only-begotten son), and at the same time required punishment of that same act (here referring to the sacking of Jerusalem under Titus Caesar, which in the mind of Dante’s age was thought to be avenging the crucifixion of Christ)? How is it that God, um, requires a sacrifice – of his only son? Requires vengeance in the form of the destruction of the holy city that God himself founded? Such notions represent a stumbling block that has tripped up not only many a non-believer, but also many a Christian. Dante says, if I’m reading correctly here (and good chance I’m not): Well, God and the Jews were in sync. That the Jews really are all of us should be evident to us as a modern audience – and that the scapegoating of the Jews is an insidious product of human sin itself should be obvious to us…more on that later. But Dante says here: humans meant it for evil, God meant it for good. The earth quaked in horror, and the heaven’s were opened for bliss. Therefore, what was the most magnificent event in all human history was also cause for vengeance and punishment at the same (paradoxical) time. Let me first turn over something of a new leaf here, and say I’m not quite sure that I’m with Dante here; at least, not completely. Let me say that the Great Poet was a child of his age, steeped in scholastic/Anselmian theories of the atonement, and medieval concepts of justice. But I don’t buy the notion that God requires a sacrifice in order to make things right. I’m more with Rene Girard, I suppose – or even Barth. To say that God required death – nay child sacrifice – is not true; WE required it. It is first God’s huge NO to the ultimate innocent death, the final way of exposing the very heart of human sin: OUR requirement of blood sacrifice, in the vain attempt to balance the scales for a while, attain some peace on the cheap at the price of a little innocent human blood. But we remember that the cross also, at the same time, contains God’s YES. In submitting to human foolishness, God both exposes to the plain light of day the nature of its violence, while also showing forth the kind of love that heals all violence: through violence, God gives himself to us, as a final act of healing our violence. This is the paradox of the cross. So, if we, especially those of us who prefer a somewhat more nuanced view of the cross than traditional atonement theology…if we strip down what Dante is trying to say poetically (and rather scholastically at the same time), we might arrive at a notion like this: how can love be love if it’s cheap? If the only cure for human madness is love, and if our madness is so extreme that only the most serious medicine will do – only a medicine that God is capable of giving – what can we say of this medicine? First of all, it ain’t cheap. Dante asks the question, really: “So, why didn’t God just forgive Adam’s indiscretion?” Why was mercy not the only medicine required? It’s mockery to think that God’s grace is so cheap that, as a salve to human conscience, we can go on with our madness with the comforting notion that God will forgive all. Or, that the crime itself was no big deal. Such an illusion, for Dante to be sure, would only further enslave us in our illusion. And what we’re after, after all, is ultimately freedom. Freedom from the illusion of freedom that Adam sought, in the attempt to take on God’s nature that ruined his, and our, own. By trying to take freedom by violence, Adam (i.e. our primordial fool) relinquished his freedom. 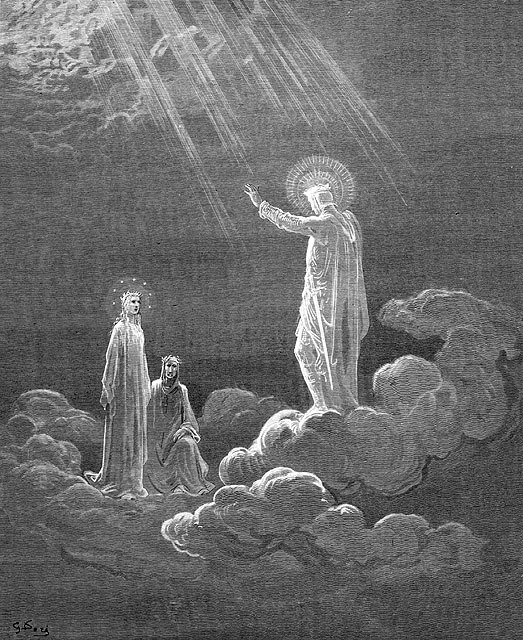 No – the crime is ultimate, says Dante; in sinning against heaven, we can’t pay a commensurate price in humility. Only the most precious ointment will make us right. This is what Bonhoeffer means when he writes of cheap grace. Cheap grace is the deadly enemy of the church…. The sacraments, the forgiveness of sin, and the consolations of religion are thrown away at cut prices. Grace without price; grace without cost! The essence of grace, we suppose, is that the account has been paid in advance; and because it has been paid, everything can be had for nothing. Since the cost was infinite, the possibilities of using and spending it are infinite. What would grace be if it were not cheap? (The Cost of Discipleship). One might say that cheap grace is the kind that let’s sin creep back in – for example, in fobbing off on the Jews the crime of crucifixion. Note that the statement itself is fraught with paradox: “Cannot be gained…by any road…that does not lead to one of these….” These, which are essentially the same. To paraphase Psalm 85, “Justice and mercy shall meet…” at the foot of the cross. But, to end, I can think of no better portrayal of how it all…works…than in this, a scene from one of my all-time favorite movies (dealing with the themes of violence, punishment, innocence, redemption): the cliffside scene in the movie The Mission. It’s about repentance and vengeance. No…it’s about forgiveness. Worth watching. But watch both of them. This entry was posted on Wednesday, February 29th, 2012 at 11:21 am	and tagged with Dante's theology of the cross, Justinian, Paradiso, Paradiso Canto 7 and posted in Paradiso. You can follow any responses to this entry through the RSS 2.0 feed.